"Overall it has been stressful and hurtful," Gelila Mesfin said. 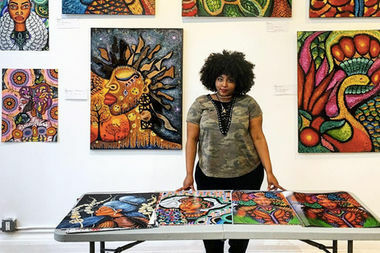 SOUTH SHORE — The woman who created the art that was "stolen" and used to make a mural of Michelle Obama said she feels under "attack" by the man who copied her work and said the whole situation has been "stressful and hurtful." Despite a statement by local artist and urban planner Chris Devins that there is a new friendship and plans for a collaboration between him and 24-year-old Gelila Mesfin, she said it’s not true. She said since she found out about the mural last Friday her life has been really stressful and all the attention has taken a toll on her. Devins’ “attacks” haven’t helped, she added. “It’s really hard to move forward with this when he keeps changing his mind and attacking my character, and overall it has been stressful and hurtful,” Mesfin said. Mesfin is an international student from Ethiopia who has been in the United States for five years. She's attending graduate school at LIM College in New York City, studying visual merchandising. She’s been taking finals this week and working on securing an internship. Although she’s studying visual merchandising, her passion is in art, she said. “I love to draw and [create] digital artwork,” Mesfin said. She always loved to doodle growing up, but she never really thought of herself as an artist, she said. Most of her work can be found on Instagram. Mesfin began receiving messages last Friday about the mural Devins put up on a wall of an apartment building on the southeast corner of 74th Street and Chappel Avenue, across the street from Bouchet Elementary School. That's two blocks from the former first lady's childhood home at 7436 S. Euclid Ave.
“People were sending me messages, like ‘Look at your artwork,'” she said. Initially, she said she was in awe that someone felt inspired to put up her work. That was before she realized she wasn’t being credited, which left her devastated and disheartened. If Devins had reached out ahead of time and asked for permission, Mesfin said she would’ve been OK with her work being used. "If he had reached out from the beginning, of course, his intent was to motivate the community, motivate the children so I would’ve been OK with it," she said. 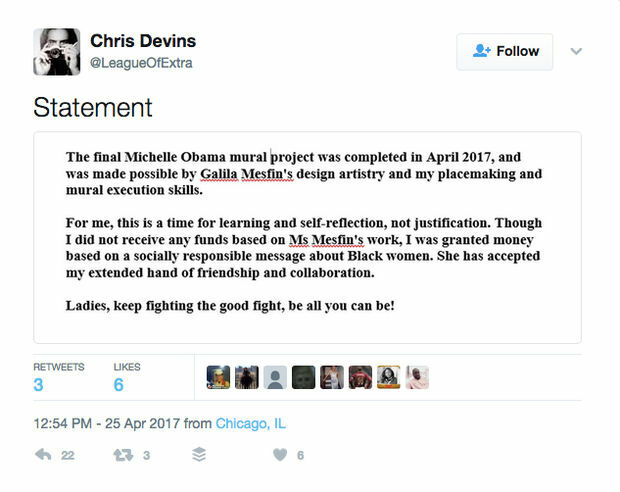 But Devis later took to Twitter and other sites to defend himself, and at one point questioned her tactics. "Um. People. If you want to go there, the so-called 'original' is "stolen" from photographer Collier Schorr," Devins wrote. "The broader conversation is one about authorship in the re-mix culture we live in and this hate coming from people who listen to music that is entirely sampled from other peoples original music. All this hate on a broader effort at community improvement." There has been a lot of support and love from strangers since the story came out, Mesfin said. A woman from Boston even started a GoFundMe for her. Devins said he plans to donate to the GoFundMe, but Mesfin said that was news to her because he hasn't told her that. He noted that licensing fees typically run $175-$500. The two haven’t come to any resolution just yet, but the conversation is still continuing, she said. Her attorney has been in touch with him. “I hope it gets resolved,” she said. Dawn Larsen, associate professor and associate dean of graduate studies at Columbia College, who oversees the school's master of arts management program, said Devins' case doesn't fit into the "found art" category, as he has claimed. "The most common definition of found art is when a work of art — it could be a mural, sculpture, any type of art — is made using components that are typically not considered to be art," Larsen said. Another definition of found art relates to things that have been abandoned, or where the owner's not traceable, she said. Larsen said neither of these definitions fit Devins' situation, based on her understanding of it. If people post work online — whether it's art, a poem, etc. — they are automatically protected by copyright, Larsen said. Even if another person does the posting, like putting it on Pinterest, copyright still protects the creator. "You have to assume that images or other copyrighted material that you find on the internet is copyrighted," she said. "That’s the default position and you have to actually try to find out who owns it." "You’re not covered if just you say 'I looked but didn’t find anybody because there are ways to do that,'" Larsen said. Some work is registered with the copyright office as additional protection, but even if it's not, that doesn't mean that the owners have given up their rights. "Not all works are necessarily registered, but they’re still protected by copyright so you can do an internet search if you can’t find anything at the copyright office," Larsen said. "There are other ways to find out. If you can’t trace it, can’t find out who the owner is, that doesn’t mean it’s safe to use." Devins said the entire situation has been a misunderstanding, although he admitted he was "sloppy" in his execution. He wasn't acting as an artist with this particular mural, he said. "I am an urban planner/artist," he said in an email late Thursday. "This is a new blending into a multi-disciplinary practice and can be confusing. It is easy to tell what I am doing though. If the images are original, as with Hyde Park Heroes, I am acting as an artist. If the images belong to the public domain or someone else, I am working as a placemaker, presenting the work of someone else. The goal is always the same, the images must re-affirm the Identity of the community." He described what he did as "creative placemaking." "This is an exciting new blending of two disciplines," he said. "If we could approach it with more of an open mind ... there is much to learn. What people are missing is that as a placemaker, I am not focusing on the production of an image solely. That's just a part of it. I am focused on the whole area, how the area frames the image, how the image interacts with the street. "When I said I wanted to depict Mrs. Obama as Egyptian, I meant it, but I meant in my capacity as a placemaker, meaning I am presenting images by someone else, often from multiple sources." "My original idea came when I noticed Mrs. Obama looked like Queen Tiye of Egypt. I had morphed the face of Mrs. Obama into the statue. That's when the unattributed image popped up on Pinterest. It felt softer, more feminine. I searched and searched and could not find the source. I proceeded, and figured the artist would emerge and I would just pay them a licensing fee. I didn't know it would be so soon and that they would be so upset. 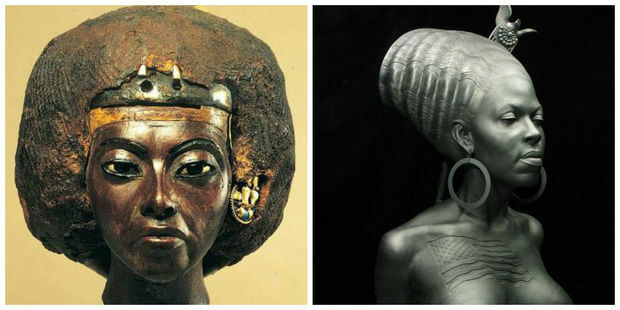 My idea to make her a Queen of Egypt was true and preceded Ms. Mesfin's image."